Spain’s Prime Minister Pedro Sánchez has said that there will be no independence for Catalonia, nor a referendum on the question if his party is returned to power. ‘No is no,’ Sánchez told a Socialist Party (PSOE) meeting at Zaragoza on Sunday, in the northeast region of Aragón, ahead of the 28 April general election. ‘If there is a socialist government, there will be no independence in Catalonia, there will be no referendum for independence and the Spanish constitution in Catalonia will not be violated – that will not happen,’ he said. Sánchez’s speech came after the socialists’ leader in Catalonia, Miquel Iceta, said in a newspaper interview back in March that if 65% of Catalans wanted independence then ‘democracy must find a mechanism to enable it [a referendum]’. 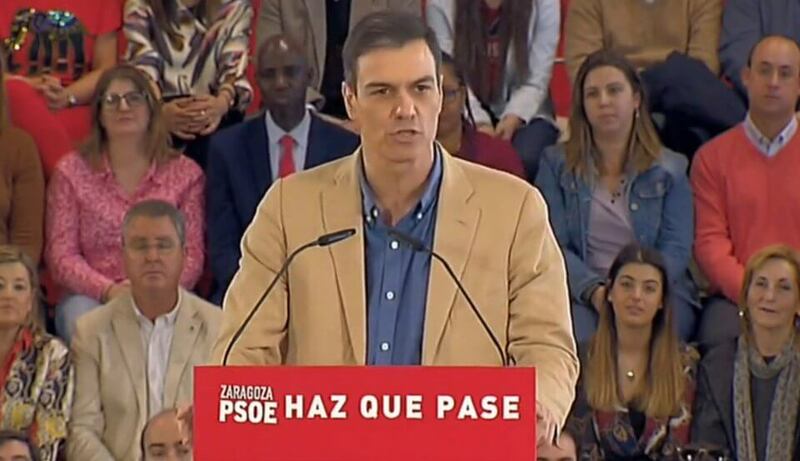 Iceta’s remarks were heavily criticised by the right-wing opposition People’s Party (PP) and again led to allegations that Sánchez is preparing a deal with Catalonia’s pro-independence parties. Back in February, the Spanish prime minister was called a ‘felon,’ ‘illegitimate’, ‘traitor’ and ‘compulsive liar’ by the opposition head Pablo Casado. The controversy came as Sánchez tried to pass his 2019 budget – which was rejected – and for which he originally needed the support of Catalan pro-independence MPs in the national parliament. It centred on a decision by Sánchez to accept the presence – as asked by Catalan pro-independence parties – of a neutral ‘rapporteur’ in future talks between parties in the northeastern Spanish region. Twelve Catalan leaders are on trial in Madrid over an independence referendum that was held on 1 October 2017 despite a court ban, as well as a short-lived declaration of independence that followed.